The early years of the Civil War saw only one significant action in Kent, an insurrection in July 1643 which began in Ightham and spread to Sevenoaks and elsewhere. What followed led to a hair-raising week for Mr Thomas Weller of Tonbridge, who has left the first-hand account quoted here*. 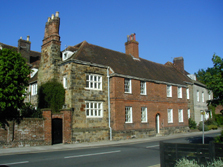 Weller was a lawyer who lived at Chauntlers in Bordyke, since renamed The Priory and The Red House. He had been drawn in on the Parliamentary side to extract taxes in the local area to support their cause, and to keep an eye on events in Tonbridge. His opponents, nominally Royalists, were a mixed bag of malcontents from the surrounding area, described as ‘independent-minded yeomen, husbandmen and craftsmen’. Some were motivated mainly by the opportunity for plunder that civil unrest would bring, and the chance to take revenge on the man who had been zealous in exacting taxes from them. Weller was in Malling when he ‘heard that there was an insurrection made at Se'noak ... whereupon I, fearing the evil affections of divers lewd persons in our town of Tonbridge, repaired immediately back thither, and getting two or three well affected men in my company searched what persons were in the town, and finding diverse of Great Peckham, Little Peckham, Ightham, Hadlow, and other partes, being persons but of very mean quality, partly by persuasion and partly by force I compelled them to leave the town’. Weller was asked to go to Sevenoaks by his superiors in the Parliamentary cause, ‘which I accordingly did do, although I confess I could have been contented to have been further off, and was very sorry that those gentlemen would put themselves into the hands of such villains, more like madd dogs then men. And being come into the town, and having passed some of their guard, I was at last taken prisoner by some which well knew my good affection to the deputy-leiftenants, and being dismounted of my horse, my sword taken from me, and myself shut up in a chamber ... I was left in the town, and kept with a strong guard about me. swords into my chamber "
Back in Tonbridge, Weller was at ‘Mr. Petly's house’ when he heard ‘that diverse of those fellows which had been at Se'noak, and were then newly returned, and diverse of our town, were going to plunder my house. Whereupon I presently ran out of the back door, and got into my house, locked the doors, put on armour, charged diverse pieces, called my servants to stand upon defence, which we accordingly did. The rebells, being by that time come before my house, demanded entrance, which was denied by me; and after I think half an hour's time, they still guarding my house and threatening with many oaths to destroy me and all that I had if I did not let them in, I as boldly defying them, there was one Mr. Mapletoft, a great agent in the business, persuaded them to leave me for that time untill they were stronger, saying in my hearing "Come away, come away; you may chance to kill him at last, but he will first spoile many of you, for he is very strong." The next day, being Thirsday, they summoned me again to deliver up my armes, and to permit them to enter my house, all which I utterly refused to do unless I had a command for it from some of the deputy-lieftenants; and about three or four o'clock that day they caused Sir John Rivers to come to my house, which I verily conceive he did on purpose to save my life (as he after said to me, for that he heard the rebells often sware they would kill me). Sir John called to me; I answered him at a window; he desired that he might speak to me in private. I refused to come to him unless I might have assurance safely to return to my house, and in the mean time not to be molested there; which being faithfully promised I went out to speak with Sir John, and being in discourse with him one Haule, a barber, liveing then at Hadlow, and now at Shoreham, endeavored to have shot me with a piece, and had done it if Sir John Rivers had not laid his hand upon the piece, and so stayed him; and immediately certain persons ... entered my house, and violently tooke from me four cosletts, 5 pikes, 4 or 5 swords, a carbine, a pistol, a flask or two with powder, one muskett, certain bandileers, and other small armes, giveing me many threatening speeches, and using opprobrious terms against me, and immediately ... went out to exercise in the field. of bed by her hair "
‘Upon Saturday morning early, being in my study, the doore locked to me, suddenly about twenty persons ... with their pistols ready cocked, their swords drawn, matches cocked in their musketts, entered my house swearing many oaths they would have me alive or dead; and immediately they fell to plundering my house, breaking open chests and trunks and presses, takeing away the greatest part of my linen, all my cloathes, the apparell of myself and wife, she being then lame a-bed of a broken leg, and thrust my linnen and other things into sacks which they brought with them, and laid them upon horses, and rode away with them. I, keeping myself in my study, heard [one say to another] " We have sped well here. Let us go to Hadlow and Peckham, and plunder there, for they are rich rogues, and so we will go away into the woods;" to whom [the other] replied, "But we must plunder none but Roundheads." Parry replied with a great oath, "We will make every man a Roundhead that hath any thing to lose. This is the time we look for." The detachment of parliamentary troops who ‘liberated’ Tonbridge was led by Colonel Richard Browne. The only significant opposition they met was at Hilden Bridge on the outskirts of the town where there was a ‘very hot fight’ lasting about three hours against some 5-600 rebels. Browne claimed to have taken some 200 prisoners and killed more than a dozen in the skirmish. Thomas Weller later moved to Eridge Green and died in 1670. *Weller’s account of these events can be read in full by following this link and finding page 26.